Leadership of PEARLS (Parents for Educational and Religious Liberty in Schools) speaking at New York’s City Hall in August. At the microphone is Rabbi Chaim Dovid Zweibel. A federal judge dismissed a lawsuit filed by an anti-yeshivah group, ruling Wednesday that the plaintiffs — former yeshivah students who have since left the community — had no standing to bring the lawsuit. U.S. District Court Judge I. Leo Glasser cast Yaffed as no different than any other political advocacy group, rejecting its attempt to portray itself as campaigners for social change. Yaffed had claimed it had standing since it spent money on mailers and billboards advocating for more secular education in yeshivos. 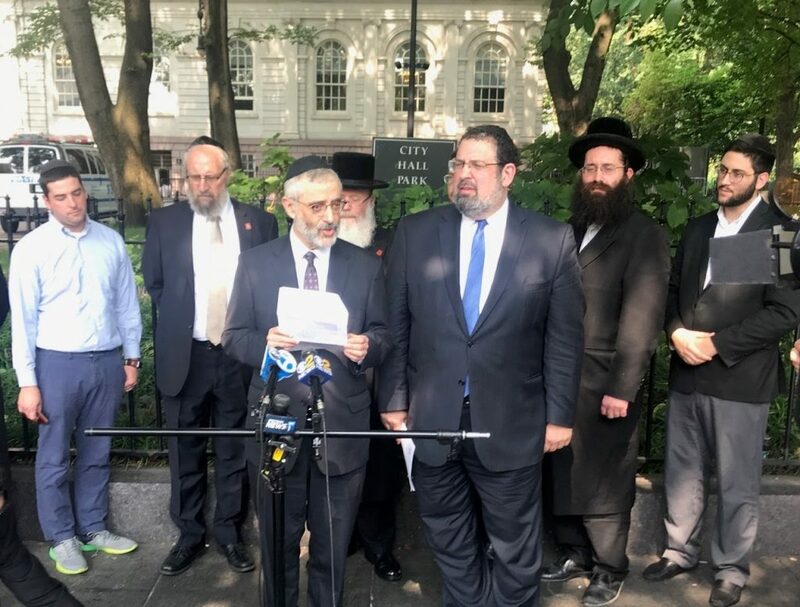 Yaffed filed the lawsuit in July, after the law sponsored by state Sen. Simcha Felder passed the New York state legislature codifying a yeshivah education. The law, known as the Felder amendment, specified that the state education department may take into account other studies when inspecting nonpublic schools with late hours and instruction in dual language — in other words, yeshivos. Guidelines issued by the state last year, which itself is the subject of a controversy over its interference into a religious institution, mention the Felder Amendment as a guidepost. The judge wrote that he was inclined to be very strict when it comes to proving that a plaintiff was injured by the law since it juggled two great democratic values — the right a child has to an education and the parents’ right to decide their child’s schooling. The lawsuit quoted a friend of the court brief filed by Parents for Educational And Religious Liberty in Schools, or PEARLS, a yeshivah advocacy organization and a court declaration by Professor Aaron Twerski, who teaches at Brooklyn Law School. The lawsuit’s dismissal, however, has no bearing on the state guidelines.